Thank you for visiting Eye Candy Creative Studio's design Shop! 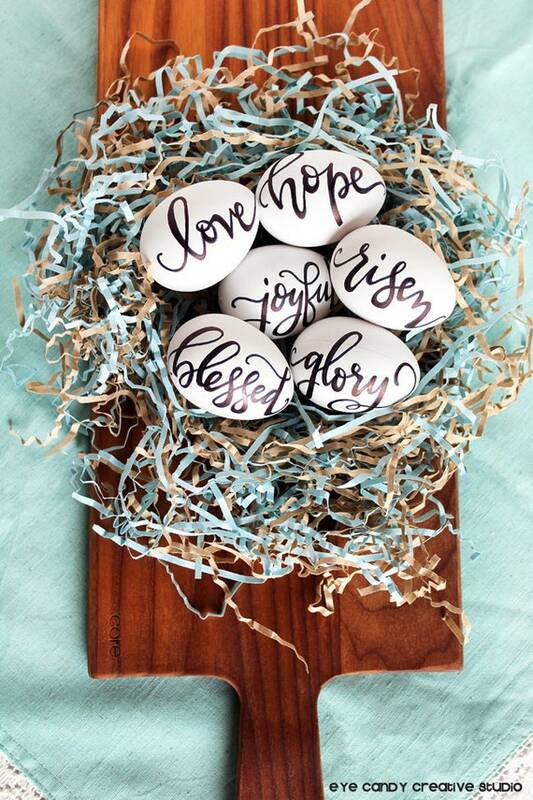 This listing is for a set of SIX custom HAND LETTERED farmhouse Easter eggs with faith based words for the holidays, party or everyday table decor! I personally hand letter each egg with YOUR information! I will hand letter & ink 6 eggs for you with the words you request. ** custom ink colors available - just ask! **need a non-religious version of these farmhouse eggs? Need more than 6? Email me & I can set up a custom listing for you! **please note due to the nature of the custom pieces and customizing each one, no two farmhouse eggs will be exactly alike which adds to the nature of the piece. These are great for Easter tables, Easter baskets & added to your farmhouse decor! Do you have a CUSTOM IDEA? I would LOVE to hand letter something for you.